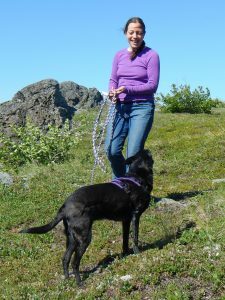 Grisha Stewart, MA, CPDT-KA is an author, international speaker, and dog trainer who specializes in dog reactivity. She runs Empowered Animals, LLC, and the online Animal Building Blocks Academy from Deadwood, Oregon. She founded and ran Ahimsa Dog Training in Seattle for 13 years, earning many awards, including Best of Western Washington. “Ahimsa” is a Buddhist doctrine of nonviolence to all living things, which reflects Grisha’s focus on empowerment to promote the well being of dogs and their humans. Her latest book, “Behavior Adjustment Training 2.0: New Practical Techniques for Fear, Frustration, and Aggression,” was published by Dogwise in early 2016. Her popular second book, “The Official Ahimsa Dog Training Manual: A Practical, Force-Free Guide to Problem Solving & Manners,” was published in 2012 and updated in 2014. Her popular BAT 2.0 DVD series about empowered socialization and training, was released in 2014. Grisha has a master’s degree in mathematics and graduate work in animal behavior. She is an enthusiastic and entertaining presenter who creates her seminars to accommodate a variety of learning styles. CLICK HERE to learn more about and purchase Girsha’s BAT 2.0 Book. Additionally, Animal Training Academy members can get 20% of Grisha’s BAT 2.0 Book, Ahimsa Dog Training Manual & BAT 2.0 Empowered Animals DVD series… To get access to this special deal and lots of other incredible membership features check out what’s on offer via an ATA membership below!